PITTSBURGH, Pa. — With the match tied at 2, and the season on the line, the University of Michigan volleyball team pulled off a gritty win over host Pittsburgh (19-25, 25-22, 25-17, 21-25,15-9) on Saturday evening (Dec. 1) inside the Petersen Events Center. The Wolverines advance to the round of 16 in the NCAA Tournament for the sixth time in program history, and the first time since 2016. U-M will face off against Texas on Friday (Dec. 7) in Provo, Utah, the home of No. 4-seeded Brigham Young. The five-set match marked Michigan’s fifth of the season and first since a 3-2 loss to Wisconsin on Oct. 27. With the win, the Wolverines are now 3-2 in five-set matches this season. Pitt took the first point of the fifth frame on a Panther kill, but Michigan was steady at the net and worked to come from behind with three blocks for a 5-3 lead and a Panther timeout. Following the stoppage in play, another block and a kill from senior Carly Skjodt pushed the Wolverines ahead to a four-point edge. Michigan totaled six blocks and took advantage of nine Pitt errors in the set to maintain a lead, and though the Panthers rallied late, the Wolverines took the set, 15-9, and the match. The teams traded points to begin the first set, but a Pitt block followed by a Panther kill put the home team up early, 6-3. Pittsburgh extended its lead to five, 13-8, with a service ace that Michigan answered with a timeout, but a Panther kill followed and pushed the lead to six. With just 10 kills at an .065 team hitting percentage, the Wolverines never regained the lead and dropped the first set, 25-19. Michigan regrouped and began the second set on a 5-1 run before Pitt worked from behind to tie the score at 7. 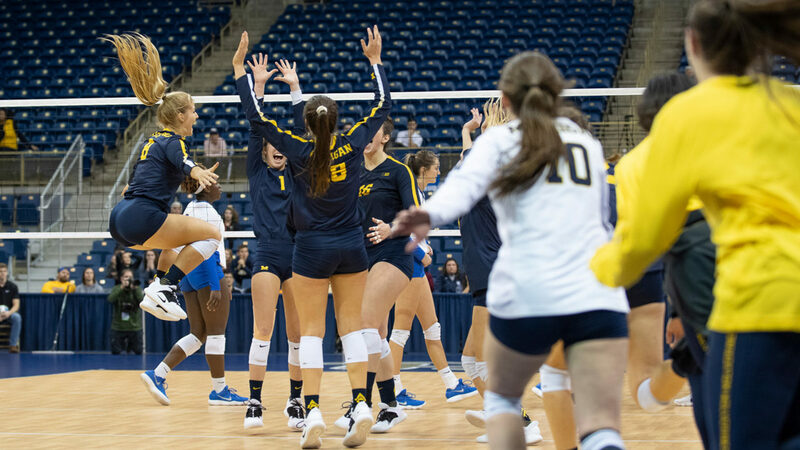 Neither team took a significant edge again until back-to-back Panther kills put Pittsburgh ahead, 17-15, but Michigan responded with a 3-0 run that included consecutive aces from freshman Paige Jones to regain a lead, 18-17. A tie score at 19 forced a Michigan timeout before a kill from Skjodt and a double-block from sophomore Kiara Shannon and junior Katarina Glavinic put the Wolverines back on top once more. The Panthers eventually fought off one set point with an overturned call on a Pitt challenge, but a 25-22 second-set victory allowed Michigan to even the match. Skjodt posted seven kills in the second frame alone as the Wolverines hit for a .286 clip. A 5-2 run that featured back-to-back aces from sophomore Natalie Smith jumpstarted the Wolverine third set, and they rode the momentum to a 14-8 lead which forced Pittsburgh’s second and final timeout. Michigan was firing on all cylinders in the third set, posting a .458 team attack average behind six kills from Skjodt and four from Jones to maintain a lead and rally for a 25-17 set victory. With Michigan leading the match, 2-1, neither team gained more than a two-point lead in the fourth set until Pitt used a 3-0 scoring spurt halfway through and went ahead, 17-14. Michigan trailed by as many as four, 20-16, but closed the gap and came within one, 21-20, on a Panther attack error. Despite the late surge and six kills in the frame from Skjodt, Pitt used a late 4-1 scoring run to clinch set four, 25-21. Skjodt finished with a match-high 20 kills, which marked her 11th 20-kill performance of the season, and Jones added 11 kills for her 20th double-digit kill effort of the year. Redshirt junior Cori Crocker also posted nine kills at a .615 hitting percentage, while junior setter MacKenzi Welsh tied her career high with seven kills at a match-high .778 attack percentage. Welsh also totaled 47 assists in the effort. Led by a career-high eight blocks from Shannon, the Wolverines combined for 12 blocks in the win. Skjodt added a career-high six block assists, while Glavinic posted five to mark a Michigan best. Michigan had four players total digs in double figures for the first time since Nov. 10, including a team-high 20 from senior libero Jenna Lerg. Smith and Skjodt both registered 13 digs, and Jones added 10. Both Skjodt and Jones finished with a kill-dig double-double. The Maize and Blue totaled seven service aces, including three from Smith to tie her career high. Welsh and Jones each added two. We're headed to the Sweet 16 for the sixth time in program history! PITTSBURGH – A historic year for back-to-back ACC Champion No. 11 Pitt (30-2) ended with the Panthers’ only five-set loss of the season, falling 3-2 in a battle with No. 18 Michigan (24-9) in the NCAA Volleyball Tournament Second Round Saturday at Petersen Events Center. After the Panthers won the first set, 25-19, the Wolverines responded by winning the next two frames, 25-22 and 25-17. Pitt forced a fifth set with a 25-21 win in the fourth, but could not hold on and fell, 15-9, in the final frame. Pitt finished the year with its highest single-season winning percentage (.938, 30-2) and its most wins since going 32-6 in 1990, in addition to the Panthers’ second consecutive ACC Championship – its first outright. Playing in what would be her final match as a Panther, senior setter Kamalani Akeo secured sole possession of third place in the Pitt record book with 3,956 career assists. She posted 28 against the Wolverines. Redshirt senior libero Angela Seman completed her Pitt career with the second-most digs of any Panther in program history with 1,851. She dug Michigan 23 times. Junior right side Nika Markovic led the Panthers with 19 kills against Michigan, pacing the team in the statistic for the fifth consecutive match. In a starting role for the Panthers, redshirt sophomore outside Zoi Faki had career highs of 12 kills and 23 digs. Michigan had the upper hand in hitting percentage (.221 to .181), despite Pitt having the advantage in kills (62-58), assists (62-57), digs (76-72) and blocks (13.0-12.0). This marks the third consecutive year with a season-ending loss in the NCAA Tournament Second Round for Pitt. The set saw three early ties, until a 3-0 run gave the Panthers a 6-3 lead. Pitt extended its lead to 14-8 following a 4-0 run, capped by a Faki kill. A 3-0 run made it 22-15 for Pitt, and the Panthers sealed the deal with a kill from Williams with a 25-19 win. Pitt hit just .152 in the set, behind three kills apiece from Layne Van Buskirk, Markovic and Faki. A 5-1 Michigan run gave the Wolverines an early advantage, but Pitt was able to tie the set (7-7) using a 6-2 run of its own. The Panthers took their first lead of the frame (12-11), following back-to-back Markovic kills. They kept the lead until a 4-0 Michigan run put the Wolverines back in front, 19-17, but kills from Williams and Markovic knotted the score again (19-19). Another 3-0 surge put Michigan ahead, 22-19, and then a 3-1 run ended the set with the Wolverines on top, 25-22. Michigan had the slight advantage in hitting percentage, .286 to .256. Michigan used a 5-0 run to reach a 6-2 lead, and extended it to 10-4 following a 4-1 run. The Wolverines kept the momentum and reached a 23-15 lead after a 3-0 run and claimed the set decisively, 25-17. The Wolverines hit a blistering .480 in the fourth set with 16 kills on 25 attempts with just four errors. Pitt could not find footing on offense, with just 10 kills and four errors to hit .222. Pitt retained its composure and used a 3-0 run to gain a 5-3 lead early in the fourth. Despite a 4-0 Michigan run and ties at 7, 10 and 12, a 4-0 run put the Panthers back in front, 14-12. Pit used runs of 3-0 and 3-1 to reach a 20-16 lead, and stayed in front for the remainder of the set, winning 25-21. The Panthers had their best set in terms of hitting percentage, posting .275 with 15 kills, four errors on 40 attempts. Markovic led the way with six kills. Although the Panthers were able to gain a 3-2 lead, the deciding blow came in the form of a 9-0 run by the Wolverines, who ultimately gained an 11-3 advantage. Pitt was able to cut its deficit to 13-9 following a 7-2 surge, but could not overcome the margin and fell, 15-9.